When you are writing a murder mystery, eventually somebody is going to have to die, but unless you have a real-life back ground in forensics and an infallible memory, you are going to need some help making your murder feel authentic and believable. Enter the “Howdunit” series from Writer’s Digest Books. This set of (at last count 13) books is designed to help a writer plan, execute, and – sometimes – prosecute the crimes his characters commit. 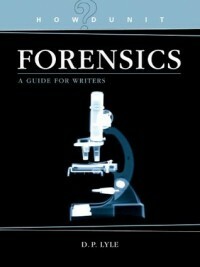 The first book in this series I stumbled upon was Howdunit Forensics, by D.P. Lyle. Lyle was born and raised in Huntsville, Alabama, hometown to yours truly, so I’ve always been interested in his work. I had the great fortune of reading Stress Fracture , one of the books in his Dub Walker thriller series, back when I was working for the Huntsville Madison County public library, where I was hoping to book him as a speaker. The Dub Walker books are set in Huntsville and it was especially eerie to read about murder in my own back yard, fiction or not! Lyle is an MD who has practices cardiology in California and has worked with novelists and TV writers on shows such Law & Order, House, and my favorite guilty pleasure – Pretty Little Liars. Identifying the body – what can a corpse reveal to the trained eye? What was the cause mechanism and manner of death? The crime scene and crime lab –what evidence can be gathered from the crime scene and how to preserve and evaluate it. I am finding Howdunit Forensics to be valuable, not just for checking the facts against what I have already written, but as a vast storehouse of ideas for my own writing that I never could have dreamed up with just a layman’s knowledge of the field. I keep this book close to me while I write, and I intent to invest in some of the other titles in the series, as well. This entry was posted in Book Reviews, Non-Mystery Book Reviews, Writers and Writing, Writing Tools and tagged books, DP Lyle, forensics, writing, writing tools by Heather. Bookmark the permalink.